Unfortunately, tennis is full of stock teaching methodology that should be banished—well-intentioned, catchy phrases that have become dated or, worse yet, were never even correct to begin with. The overhead smash is a shot that puts fear in the hearts of most amateurs. As everybody knows, tennis is a game of errors. Deciphering the actual cause of the error is the initial step in error reduction. In Championship Tennis, Frank Giampaolo and Jon Levey cover the most important aspects of training, including athletic assessment, skill development, physical and mental preparation, practicing, and planning. It includes proven practice drills for mastering strokes, anticipatory skills, and styles of play. control your emotions and mentally prepare for every match. You’ll also find the most effective, unparalleled drills for mastering groundstrokes, serves, volleys, and specialty shots as well as invaluable advice for improving anticipatory skills and recognizing, neutralizing, and countering your competition’s strengths and playing styles. 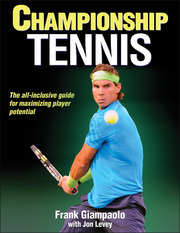 Add a copy of Championship Tennis to your bookshelf and turn errors into winners and three-set losses into straight-set wins. This is a must-have resource for players and instructors seeking to maximize potential as quickly as possible. Frank Giampaolo is a veteran author who’s acclaimed book, The Tennis Parent’s Bible (www.thetennisparentsbible.com), is being used by ITF leaders, academy directors, parents, and coaches worldwide. Giampaolo’s innovative approach has earned him numerous honors, including being named the 2001 USPTA Southern California Tennis Director of the Year and being voted a top teaching professional in consecutive years by Southern California Tennis & Golf magazine. Giampaolo founded the Mental–Emotional Tennis Workshop in 2002; since then, participants in the program have gone on to win more than 71 U.S. national titles. His students have won ATP and WTA Tour singles and doubles titles. Giampaolo pioneered the Tennis Parents Workshop in 1998 and has conducted seminars throughout the United States, Mexico, Australia, and Canada. Additionally, he hosts a blog site, www.tennisparentsolutions.com.